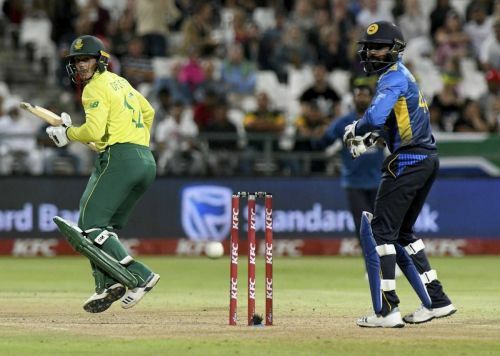 South Africa defeated Sri Lanka in a thrilling T20I played at Newlands, Cape Town on Wednesday. Faf du Plessis decided to bowl first and restricted Sri Lanka to a modest total but made a mess of the chase in the end as the match ended in a tie. Imran Tahir held his nerve in the super over to put the Proteas 1-0 up. South African captain Faf du Plessis won the toss and decided to field first. The hosts got off to a great start as they picked up two early wickets of Dickwella and Kusal Mendis. Fernando and Kamindu Mendis played some lovely strokes to put pressure back on the South African bowlers. At the end of 6 overs, Sri Lanka were 42 for 3. South Africa kept picking wickets at regular intervals and did not allow Sri Lanka to score runs easily. Thisara Perera and Dhananjaya de Silva struggled to time the ball but at the end. Isuru Udana and Dananjaya added 21 quickfire runs at the end to help Sri Lanka post 134 for 7. Mendis was the top scorer for Sri Lanka with 41 runs. For South Africa, Andile Phehlukwayo was the pick of bowlers with 3 for 25. Chasing the target of 135 runs to win, Quinton de Kock and Reeza Hendricks got the team off to a decent start as the duo added 21 runs for the first wicket. Sri Lanka got the breakthrough with a brilliant run out by Dananjaya. At the end of 6 overs, South Africa were 33 for 1. Akila Dananjaya then struck by dismissing the inform de Kock for 13 runs. The Sri Lankan bowlers did not allow Faf du Plessis and van der Dussen to score runs easily. David Miller came to the crease and made the batting look easy with some attacking strokes. Miller and van der Dussen added 66 runs for the 4th wicket. After the fall of van der Dussen, Sri Lanka came back strongly as Malinga bowled a stunning 19th over and gave away only two runs. With two runs required off the last ball, Dickwella missed a run-out chance and match ended in a tie. In the super over, David Miller hit a six and a four off Malinga's bowling to set a target of 15 runs to win. Imran Tahir held his nerves and conceded just five runs which gave the hosts a thrilling win. Brief scores: South Africa 134 for 8 in 20 overs (David Miller 41, Rassie Van der Dussen 34, Lasith Malinga 2/11, Vandersay 1/25) beat Sri Lanka 134 for 7 in 20 overs (Mendis 41, Phehluwkayo 3/25) in a super over.